*Not to be confused with haute cuisine. Oh no. Definitely not in my kitchen. There was a time when I considered oatmeal for breakfast something akin to punishment. What did I do to deserve mushy, flavorless gruel with the texture of mucous to kick start my day? I still don't love the stuff in that form, but I've discovered the magic of sweeteners and mix-ins and now I consider it acceptable breakfast fare. My new favorite use for oats, which in the past has been things like cookies (cocoatmeal scotchies FTW!) and crisp toppings, is this pie, aptly named Oatmeal Pie. It can essentially be described as pecan pie with oats replacing the nuts. Confession: I LOVE pecan pie. It's too sweet** for my boyfriend, but I think it's amazing. Crunchy toasted pecans coated in sugary, syrupy goo atop a pastry crust is pretty much my idea of heaven on earth. Why would I go and swap out pecans for oats, their much lamer first cousin twice removed? Well, pecans are freakin' expensive and I didn't have any on hand. I did have oats and I had just seen this pie, so I decided to give it a try. **I'm sorry, "too sweet"? I'm unfamiliar with this phrase, please explain it to me. It's good! I toasted the oats a bit before adding them into the filling mixture in hopes of bringing out some extra nuttiness, and I liked the results. 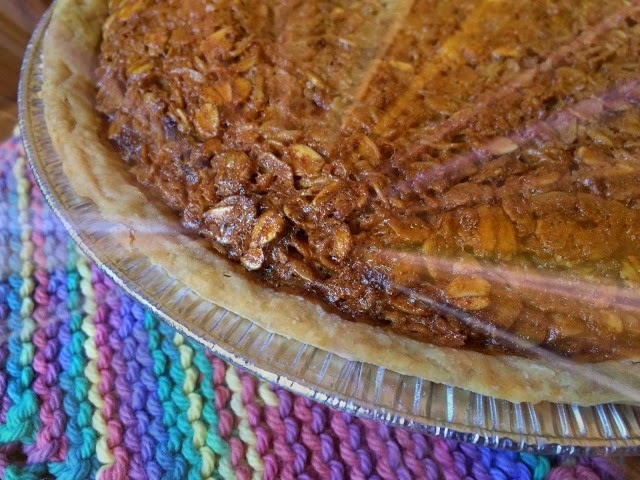 The top of this pie is super crunchy--its texture and flavor actually reminded me of an oatmeal cookie. The goo is concentrated on the bottom, so when you break through the oats on top, you bury your fork in some wonderfully sweet pie filling. My theory is that since oats are so light, they all migrated to the top while pecans are a bit heavier and stay suspended in the goo. Whatever happened inside that oven, it was magical and I was pleased with the results. Watch out, pecan pie! Oatmeal pie is nipping at your heels! In a large bowl, whisk together the brown sugar, flour, cinnamon, nutmeg, and salt. In another bowl, mix the beaten eggs, corn syrup, melted butter, and vanilla until well blended. Add the wet ingredients to the dry and mix until everything is incorporated. 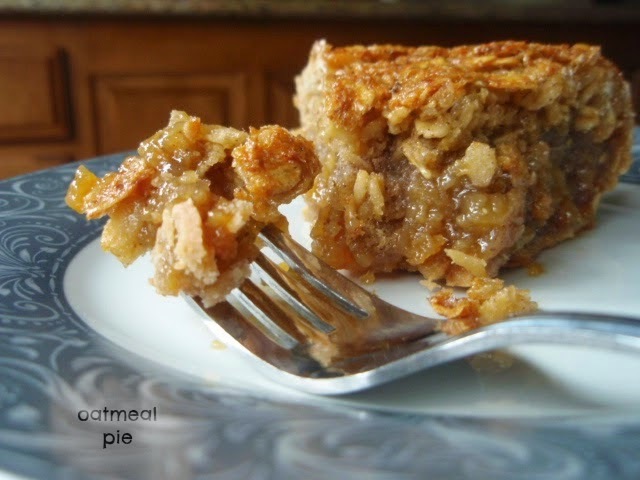 Stir in oatmeal and pour into unbaked pie crust. Bake for 45-50 minutes; pie is done when the top is brown and the center is slightly jiggly. Let the pie cool at room temperature for at least an hour before slicing. Be sure to store any uneaten pie in the fridge! This looks amazing! We love oats in any form, esp. in cookies and sweets. Because of the g-normous number of calories, I don't make pecan pie anymore. But I confess, when I was a kid, my mother used to freeze pecan pie tarts and I spent my young life snitching them out of the freezer. And into adulthood, I still prefer pecan pie frozen. My mouth is watering just thinking about it! So that's why I avoid it...I have no willpower. None. I'd eat the whole pie. I love this take on the pecans...bet it's nearly as good, oatmeal included! A fabulous pie! I am a big fan of oats. Oooh! Like a flapjack in a pie! I think I'd add some lemon zest, just to take the edge off the sweetness. My husband sometimes says "too sweet" to me. I do not understand. This pie looks perfect! This pies looks wonderful!I love oats..fantastic idea! Yes, this is way better than a bowl of mushy oats! I love pecan pie too. This oat pie looks and sounds amazing. Bookmarked. This is a great idea and I bet the crunchiness of the pie is amazing! This is new to me, and now I have to try it! The crispy oats on top of the gooey middle sounds delightful. The way you describe this pie, I should probably bake it tonight, it sounds amazing! How creative! I like the idea of "poor man's pecan pie"! Looks delicious. Poor mans pecan pie, I love it. And yes, dang those pecans being so expensive. I remember living in SC and picking everyones pecans out of their yards because no one wanted them. Then of course shucking them was an eternity. Stop by my blog for a chance to win Red Pack tomatoes. It has been way too long since we "visited".